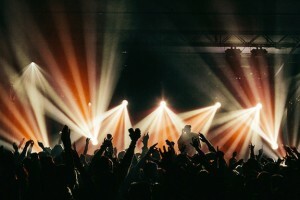 Held March 12-18 in Austin, the annual South By Southwest Music Conference has in recent years grown to encompass film and interactive media, but for many who travel to Texas, it's all about the music. With over 2,000 acts from 49 countries performing on over 100 stages, the capital city truly lives up to its' moniker, 'Live Music Capital Of The World'. And although SXSW's focus remains on emerging talent, established artists now line up to play intimate showcases during the festival. With Austin as home base, High End Systems takes a unique approach to the festival, both in support of the visiting lighting designers - many who are embracing the new Hog 4 console, and of the amazing Hype Hotel venue, which featured Passion Pit, Cold War Kids, Ra Ra Riot and 60 other performers at the transformed downtown space. Sponsored by Taco Bell, Hype Hotel is the brainchild of MP3 blog aggregator Hype Machine. Founder Anthony Volodkin explains: "The Hype Machine has worked in partnership with Taco Bell to create a diverse showcase of fantastic artists who have gained popularity on hypem.com, all under one roof in a raw space we created from the ground up. The huge amount of trust between the different teams in this partnership allowed us to create a remarkable experience that transformed excitement about music on the web into an intense live show."